Best Two Wineries in Georgia: Yes, two of the Best Wineries and Vineyards are located right here in our Corner of Northeast Georgia Known as Rabun County. 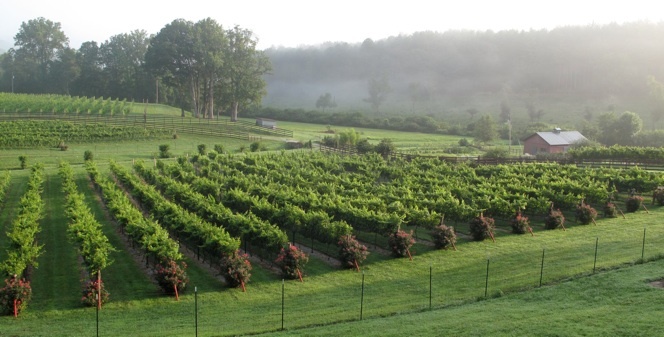 They are Tiger Mountains Vineyards and Stonewall Creek Vineyards, both just a short distance from Beechwood Inn. Georgia Wine Producers, an organization uniting wine producers in Georgia from north to south, concluded their third annual Georgia Trustees Wine Challenge, and the superlative trophies and best of class certificates were awarded. For the third year in a row Rabun County Wineries were recognized as some of the best wine producers in the state. Wineries were honored for wines made from grapes grown in Georgia and for wines made from grapes grown outside the state but made in Georgia. Attendees to the competition and awards ceremony came from all over the United States, from California to Wisconsin to Massachusetts and the nation’s capital as well as from Georgia. Judges came from many aspects of the wine industry, including retailers, wine educators, distributors and journalists. Named to honor the Trustees who founded the Georgia colony in 1733 and tasked its settlers with growing grapes and making wine, the competition saw the participation of most of the state’s nearly 50 bonded wineries. Parks Redwine, president of Atlanta Improvement Company and director of two competitions, served as this competition’s director. The 2017 “Gay Dellinger Award” – Best Vinifera Wine, Overall and White was awarded to Tiger Mountain Vineyards for its 2016 Petit Menseng. . This award is named for the late Gay Dellinger, a pioneer in Georgia’s post-Prohibition wine industry comeback. They also won another Gold Medal for their Rosé. But let’s not stop there. Last year at the 2016 competition our own Rabun County winery Stonewall Creek Vineyards came away with two of the top awards. 2016 saw them honored with the year’s “Best of Competition” Oglethorpe Award for its 2014 Petit Manseng “Boriana.” This Award recognizes the best 100% Georgia-grown and made wine competing among that year’s Gold Medal Winners in the categories of Vinifera, Hybrid, Dessert, Sparkling, Fruit and Muscadine. Winemaker Carl Fackler added, “We’re delighted our 2014 Boriana was named Best of Competition. Our other entry, 2014 Cabernet Franc, was named Best Red Wine, Vinifera and ended up competing with our white wine for the Best Vinifera award. At last year’s competition Tiger Mountain Vineyards won the Best Dessert Wine category with their 2014 “Sweet Petit” Late Harvest Petit Manseng and a Bronze medal for their 2014 Cabernet Franc.